MOSCOW, April 8. /TASS/. 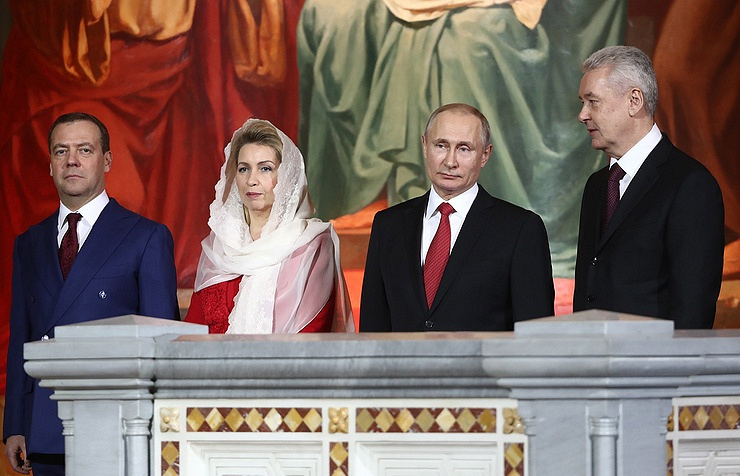 Russian President Vladimir Putin and Prime Minister Dmitry Medvedev with his wife Svetlana Medvedev have arrived to the Easter Service in Moscow’s Christ the Savior Cathedral. The service, conducted by Patriarch of Moscow and All Russia Kirill, the head of the Russian Orthodox Church, is also attended by Moscow Mayor Sergei Sobyanin and other prominent political and public figures. 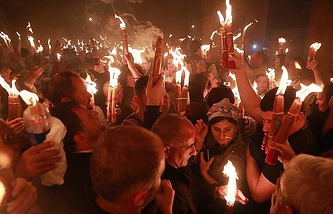 Shortly before midnight, a capsule containing the Holy Fire from Jerusalem has been brought to the cathedral. In line with a longstanding tradition, Putin attends the night-time service at the Cathedral of Christ the Savior on Easter, but leaves Moscow for Christmas. The tradition was broken only once, in 2003, when Putin was on an official visit to Tajikistan and attended the Easter service in the St. Nicholas Cathedral in the Tajik capital Dushanbe.